Get ready for business in minutes. 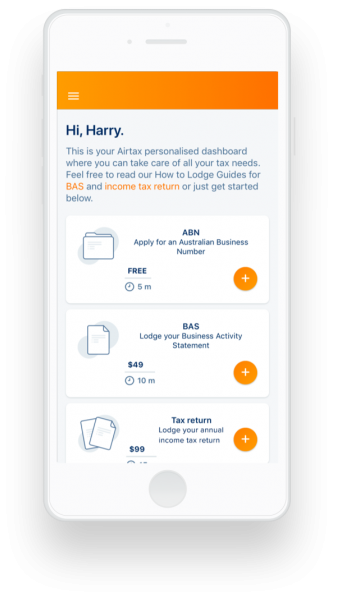 From your dashboard you have the option to register your ABN / GST, or start a tax lodgement (you can come back to this anytime). Complete your ABN / GST registration following the prompts. We'll be in touch when everything is confirmed. Airtax was founded by PwC Australia in 2016 and designed by certified accountants so you can be confident that your tax is being handled by specialists. When you lodge with Airtax, we show you average expense claims, and prompt you to claim deductions you may have missed, helping to optimise your tax return. "I love Airtax because its so easy and simple and also affordable. Running a small business requires a lot of time and effort and you guys just make taxation so much easier and less of a worry."